Mobility support is deemed a fundamental service for the next-generation Internet. The current cellular network is the only large-scale infrastructure that successfully provides wide-area, ubiquitous mobility support in reality. With the explosive growth of smartphone devices and the surge of mobile data traffic, cellular networks have been evolving into an increasingly heterogeneous networked system. As a result, managing mobility becomes challenging yet rewarding. This project seeks to study the configuration issues on mobility management of 2G/3G/4G networks, in order to ensure desirable mobility support. The research focuses on assessing two structural properties: stability and reachability . Stability implies no persistent oscillation loops during constant network conditions, while reachability denotes no access black hole (e.g., certain cells or even a given mobile technology (e.g., 4G) cannot be reached by the device). The success of the project will not only identify and characterize misconfigurations in today's cellular networks, but also protect multi-trillion dollar investment in the fast expanding mobile information infrastructure. The obtained results may influence the design of upcoming 5G wireless networks. The proposed research has three key areas of technical contributions. First, it takes a novel approach to configuration study. It models and analyzes problematic cases and comes up with a taxonomy of instability and unreachability for the mobility configuration problems, and derives triggering conditions for each problematic instance. The fundamental problem lies in its distributed, yet not well-coordinated configuration decision-making. Second, the project covers activities from theory to practice. Given the misconfiguration instances discovered in theory, it further empirically assesses them in operational mobile networks. 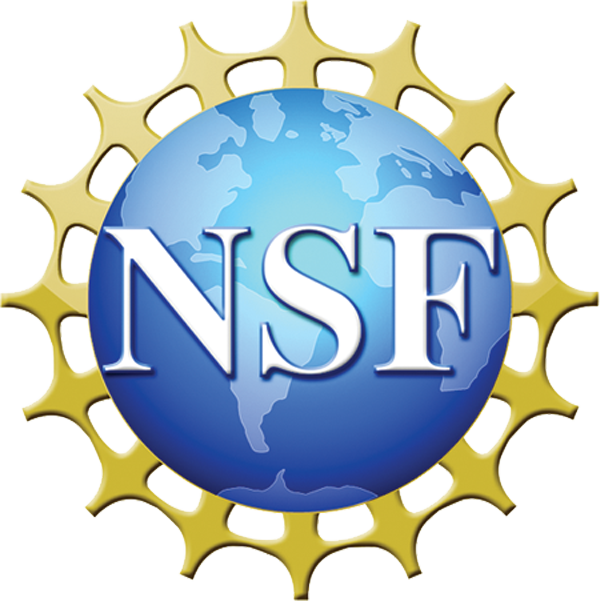 It seeks to measure their likelihood in reality and quantify their negative impacts on both the user device and the network infrastructure. The diversified root causes are to be analyzed, spanning policy conflicts within a single parameter, inconsistency between different types of parameters, and uncoordinated decisions between the device and the network. Last, the research proposes new solutions to configuration management in mobile networks. This research simplifies the current approach, while retaining its full configurability for parameters. To this end, two design guidelines of minimal replication of decision rules and no multi-hop mobility decision are explored in order to ensure both stability and reachability of mobility support. In this work, we focus on two critical properties of the mobility configuration, which are defined as follows. Stability:Given any user device U, its serving cell S and metrics X, the converged, target cell T should remain stable and unchanged. If this property does not hold, persistent loops may occur. The device would then oscillate between a set of cells, incurring data delay/drops and signaling overhead. We focus on the persistent loops rather than those transient loops (e.g., the loops caused by radio quality oscillations), because they have lasting negative impact and can be prevented with proper mobility configuration. Reachability:Given a device U, its serving cell S and a target cell T that is available to U at the given location, there always exists a set of metrics X that (1) given these metrics, the device would be finally migrated from S to T; (2) these metrics are anticipated by S's mobility decision rules. If this property is violated, the device may get stuck in S, never reach T, or move to T when S's rules do not intend to. Note that the above properties cannot cover all desirable features, but serve as good reference points to study system-level properties. Moreover, we do not claim that both properties are sufficient to ensure good design in all cases. Even though both properties are satisfied, the mobility decision can still have issues. For example, if the 2G's reselection threshold is too rigid, the device may still be trapped in 2G despite good radio quality from 4G. These are issues incurred by carrier?s preferences or easy-to-fix mistakes. Our modeling framework covers both mobility schemes for the idle and active states. Given a user device U, the current serving cell S, and a set of metrics X to be assessed, a mobility decision is defined as: S x U x X -> T, where T is the target cell. if T = S, it implies that the decision is to stay at the current cell; otherwise, the device will migrate from S to T.
Our framework further models the following two schemes during idle-state and active-state (RRC connected). Idle-state Mobility Decision:At the idle state, the device reselects a new serving cell for better network access later. To this end, the device performs cell (re)selection, a fully standardized decision logic. The serving cell broadcasts the re-selection parameters to the idle device (listed in Table 1), including the candidate cells, preference level for each cell, and radio evaluation thresholds for each cell. The device then selects the target cell among candidates. For each candidate cell, if its priority is higher than the serving cell, it would be selected if its radio quality is better than the threshold Thresh1. If its priority is lower than the serving cell, it would be selected if the serving cell?s signal strength is below threshold Thresh3, and the candidate cell?s radio quality is better than the threshold Thresh2. If its priority is equal to the serving cell, it would be selected if its signal strength is Hyst offset better than that of the serving cell. If there are multiple cells satisfying above conditions, the cell with the highest priority would be selected. Active-state Mobility Decision:At the active state, the device actively connects to the serving cell. The serving cell decides the target cell the device should move to. Different from the idle-state mobility, there is no standardized decision logic for the active-state mobility. The carrier has freedom to customize its decision logic, metrics to be evaluated, and parameters for decision-making. However, the 3GPP standards define several auxiliary configurations to facilitate the active-state mobility, and the carrier may choose whether/how to use them. Such configurations include: (1) radio assessment criteria, where the serving cell asks the device to report its perceived radio quality. 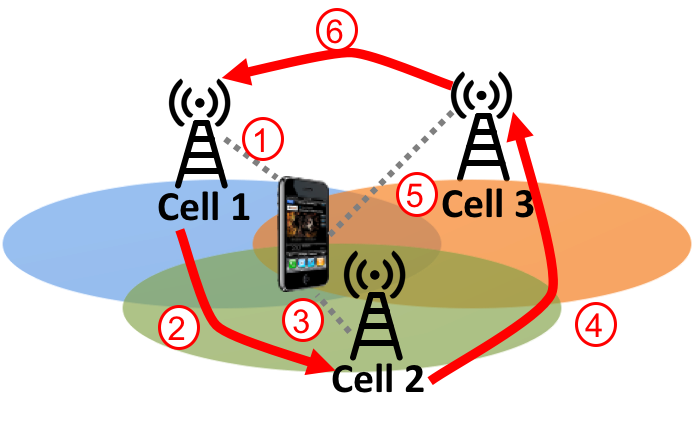 The criteria include the candidate cells to be evaluated, the radio thresholds, and the timers for radio evaluation; (2) traffic evaluation criteria, where the serving cell asks the device to report its traffic load; (3) cell priorities (e.g., SPID), which are kept internally by the serving cell and help to decide which cell to select; (4) access control list, which restricts the available target cells. We identify persistent handoff loops in US carrier networks. The above figures show a real example observed in our study. 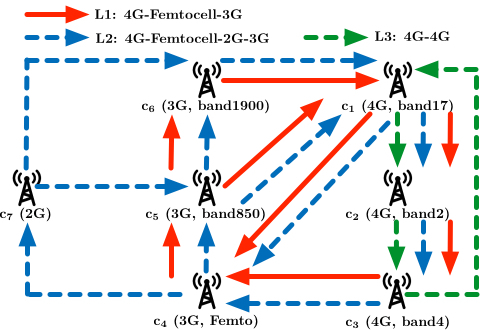 This loop occurs between 4G cell (cell 1), 3G Femtocell (cell 2) and 3G Cell (cell 3). The loop lasts 48 hours and there is no sign to stop. 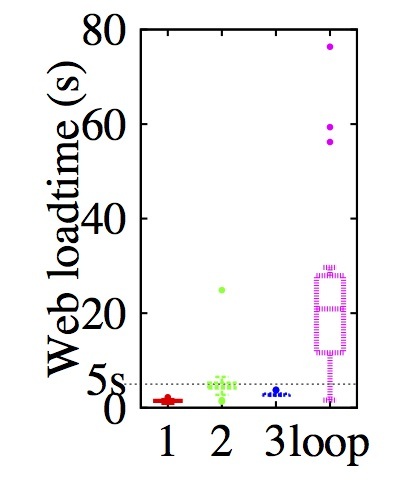 The second plots shows 1-hr log and the 3rd, 4th, 5th plots show the incurred signaling message numbers, the downloading time (of a 5MB file) and webpage loading time (CNN). C1: uncoordinated handoff goals. 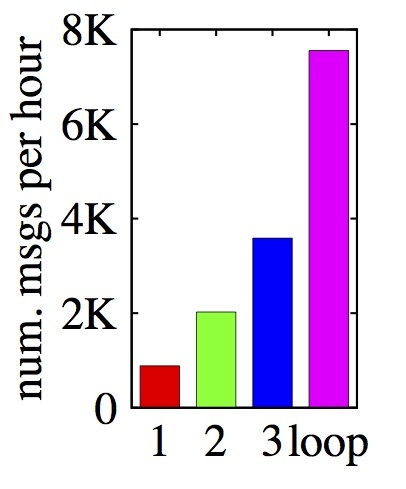 In this category, 8 variants of loops are reported, all happening between 4G Macrocell, Femtocell and 3G Macrocells. The example in x3 illustrates the smallest loop here, with c1 = 4G, c2 = Femtocell and c3 = 3G. 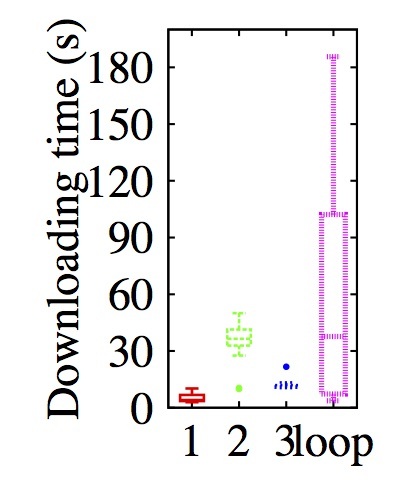 These loops are caused by conflicting preference settings for conflicting goals: the 4G Macrocells intend to offload user his/her private Femtocells, but 3G Macrocells prefers to move user to high-speed 4G network. C3: imprudent 4G infrastructure upgrade. The last variant is one 4G-only loop. We observe that US-I is upgrading its 4G infrastructure, and deploying cells under a new frequency band (c2). Before the upgrade, existing 4G cells (c1 and c3 in Figure 4) assign equal preferences to each other. US-I intends to migrate users to the new cells, which offers higher bandwidth. To achieve it, some old cells (c1) configures new cells with a higher preference. However, not all cells? preferences are updated timely: preference ties still happen on some cells (c2). C4: Uncoordinated load balancing. This is one loop between two 4G cells at one location during active. Both cells try to offload the user to each other when both signal strength are higher than a threshold (here, -106 dBm). However, such load balancing policies are not coordinated, so the user oscillates between cells. When both 4G cells have higher - 106dBm Fortunately, this loop is not commonly observed. IEEE/ACM Transactions on Networking (ToN), Volume 26 Issue 6 (December 2018): 2542--2555. 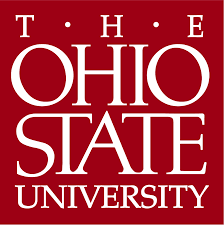 We gratefully acknowledge research support from NSF (CNS-1526456 and CNS-1526985) and the departmental support from OSU.